As I've said before, I think PopCap publishes really great games. Even when it's something as simple as a match 3 game, their attention to detail and high production values set their games apart from the crowd. It's not always about flash though: many PopCap games are also great at presenting the player with interesting choices and game dynamics. This is the case with Solitaire Blitz, one of the Facebook games I've been playing as part of my ongoing quest to improve my knowledge of the social games scene. 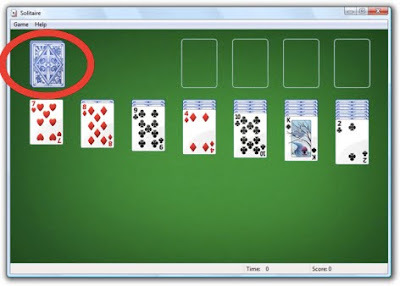 Solitaire Blitz is a variant on the Klondike Solitaire ruleset. The goal is to get all the card columns into the top stacks before you cycle through the rest of the deck or run out of time. The rules are slightly different, in that cards don't need to be stacked by suit and can be stacked in ascending or descending order (for example, a 4 can be laid on either a 5 or a 3, regardless of suit). I quickly grasped the basic rules, but found myself having an unusual problem: I kept accidentally pausing the game. The portion I've circled controls the pausing and unpausing of the game. It also houses the timer and the game's mascot: a cartoonish worm that wriggles and makes noises as you play. This draws a lot of attention to that corner of the screen, which in turn makes it easy for your cursor to drift over there. It's not a deal breaker, but it can be distracting. Who knows? Maybe this is part of the game's challenge. However, it's not like the draw deck is hidden. On the contrary, the cards are big and they're quite close to both the top rows and the bottom columns, which allows you to see most of the important parts of the game in a single glance. But if that's the case, why did I find myself inadvertently pausing the game? I've undoubtedly played hundreds, if not thousands, of games of Solitaire in my life. The vast majority of these games were played using a particular interface that, while perhaps not perfect, has successfully trained me to play in a certain way. 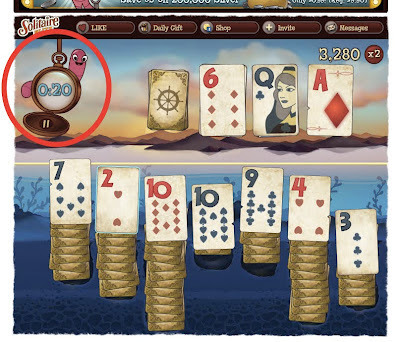 The fact that I kept mistaking Solitaire Blitz pause button for the draw deck isn't necessarily a slight against the game's design, so much as it is a demonstration of how much influence entrenched design conventions wield. I actually think PopCap's way makes more sense: having the deck closer to the top row means it is in a more central location relative the bottom stacks you'll be working with. Placing it there minimizes the average distance you need to move your cursor while playing, which is important in a game in with a time limit. However, making this choice means I have to unlearn decades of behavior that has been hardwired into my brain. On top of this, the decision to put a lively, moving sprite with important information in that location further draws my attention to the area. Again, this isn't to say that the design decisions made in Solitaire Blitz are bad; it just illustrates how influential subtle details can be. Should you try to quickly chain together cards for a score multiplier or go for a time bonus? Is a quick glance enough to tell how many cards are blocking the bonus time line, or do I need to count them carefully? When considering your next move, what do you do if you have multiple options? Is it worth the precious seconds it takes to think about the next few moves before you make them? Is a good combo worth more than immediately unlocking another deck space in the top row? I purposely ignored the game's larger financial model in this discussion, which is based on the Facebook free-to-play "energy" system. Unsurprisingly, you can circumvent this limitation by involving your Facebook friends in the game or by simply paying for more energy with real money. On top of all this, there are powerups you can use before a round that can do everything from extend the time limit to give you bonus cards. Similarly to the way energy is implemented, these items can be bought with in game cash earned from winning, by enticing your friends to play the game, or by simply opening your real-world wallet. The important thing to note about this is that none of the game's core mechanics are hampered by the financial model. This is something I think a lot of social developers can learn from. Even if you never pay anything out of pocket, you'll still be able to experience the system of interesting, meaningful, cascading decisions that makes Solitaire Blitz an outstanding game.